Mamma mia! Turns out the recent earthquakes in Italy didn’t just injure a few people. They also cost the country incalculable costs in ruined cheese. The rumbling ground shook down hundreds of towering stacks of cheese wheels, each bearing thousands of tonne-weight hard cheeses. 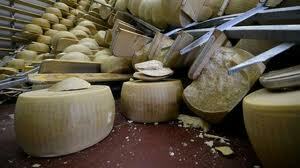 It takes almost a year to mature an entire cheese wheel, and more than a few dramatic Italian tears were shed at the damage. 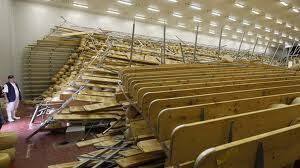 A troop of heroic volunteers dubbed the ‘parmesan angels’ even showed up to help repair the damage. The up side of this terrible disaster is that after the event I discovered a whole new kind of cheese. Grana Padano – ‘grainy cheese’ is actually more popular in Italy than parmesan. But rather than sprinkle in on pasta the Italians dig it out in flavoursome chunks and eat it by the handful. This kind of cheese has an incredible chewy grainy texture, and is mild enough to eat in larger quantities than the full bodied parmesan. Seriously delicious, although I did overdo it a bit. I took a very large portion home with me courtesy of the Consortium of Grana Padano Cheese. They allowed me a little peek into their circular debating chamber which rivals the Whitehouse in size and spec. I imagine the meeting of all the cheese-makers plays out like ‘what are we going to do about the cheese?’ and ‘we need to make more cheese!” and so forth. 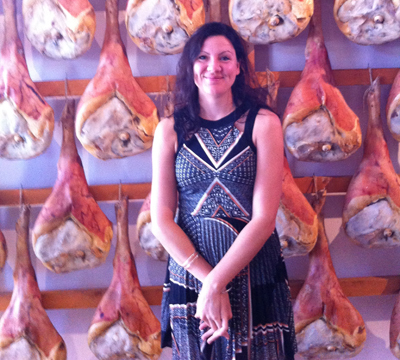 When the warm weather sets in, thoughts in Northern Italy turn to pig. 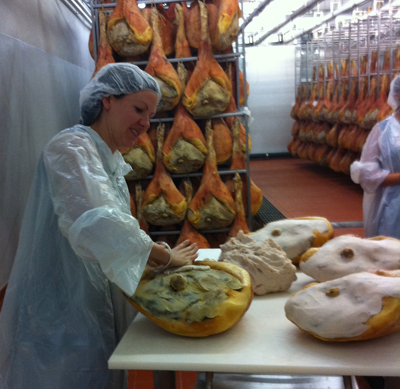 Or, more accurately, prosciutto. This wafer thin ham is a national obsession, and every year on midsummer’s eve, the small town of San Daniele throws a ham party to end all ham parties. At the festival, farmers from all over the region show up to showcase their wares. There’s a ham lottery, a ham awards ceremony, and plenty of ham-related music courtesy of local bands. This year there was also a protester in situ, whose tasteful leather placard proclaimed ‘The Pig Is Not What It used To Be!” But tantalisingly neglected to elaborate. 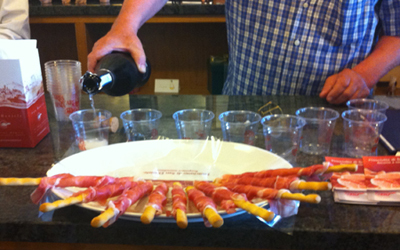 San Daniele is to ham what Southern France is to wine, with a myriad of ham-makers big and small scattered everywhere. As with vineyard hopping, it’s the done thing to pop around sampling from different producers, buying hunks here and there to store at home. So prior to the evening ham festival I was kindly whisked around several producers, courtesy of PR heavy-weight Cohn&Wolfe, who arranged a three day eat-athon, in which myself and other journalists were never more than half an hour from a thousand calorie meal. Part of this involved the obligatory tour of the factories in which we were kindly allowed to ruin several hams, by becoming involved in the production process. This included smearing pig fat over the rindless upper thigh of the preserved pig leg (see below, I clearly have a gift). A successful trip all round, and not only because I got to add to my growing collection of plastic shoes and hairnets. Ribollita is one of those hearty rib-sticking type of soup/stews which you eat on cold days with big hunks of chewy bread. It’s a Tuscan specialty, it being chilly in those parts during the winter months, and like a good Bolognese everyone has their own special recipe. This means that ribollita’s can look surprisingly different depending on where you eat them. The classic ingredients are bread, beans, potato and plenty of olive oil, so depending on the ratio you can have it made with whole beans, or a blended soup – but it’s always chunky and filling. Don’t make the mistake of ordering it as a starter unless you’re in for the long haul – this is a super filling soup. But delicious, and one of those brilliant Italian conduits for flavoursome olive oil and fresh bread. I tried ribollita in loads of places, but you’ll want to eat in a trattoria for authenticity. 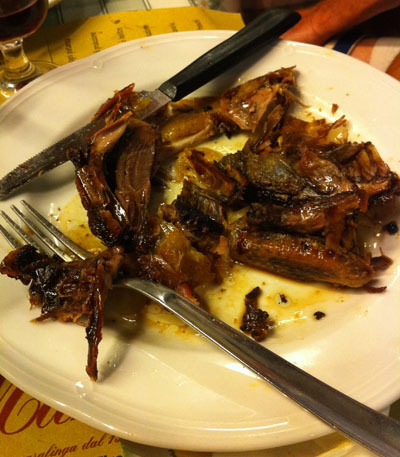 I can recommend Trattoria Marios (see previous post for details) and Trattoria Coco Lezzone. Bit on the greasy side and disturbingly full of gunshot, but really tasty rich meat. I wouldn’t want to eat it every day, but all in all a good choice. And less fiddly to eat than that sparrow we tried in Cambodia. I ate this in one of those restaurants which manages to straddle the divide between hidden gem and major tourist spot. Marios is a tiny little restaurant opposite the Mercato Centrale which is very well known but simultaneously manages to avoid the usual tourist perils of overcharging and international décor with picture menus. I think the technical term for this is ‘institution’, and it’s hidden away enough that you can feel passably smug for having sought it out. 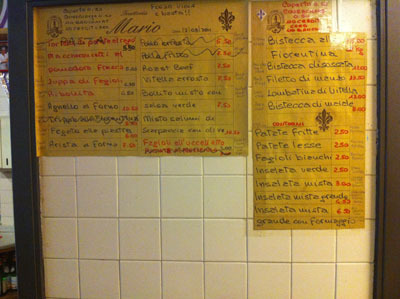 It’s a traditional trattoria, so the daily menu is written up on the wall with the idea that you order the first plate if you’re after a light lunch, the first and second if you’re looking for something more substantial, and the full three courses if you’re making an afternoon of it. My advice – unless you’re really hungry just go one course, but make it really clear you’re skipping the ‘first plate’ which is a substantial stew/soup with equivocal hunk of bread. I know what you’re thinking – all that beautiful Italian food, how did she manage to unearth something which sounds so unappetising? I was pretty pleased with myself I must say, since I would otherwise have been relugated to posting pretty pictures of gelato etc. which would have been boring to say the least. Picture from www.breadetbutter.wordpress.com who have done much better justice to this tasty sandwich than I did. 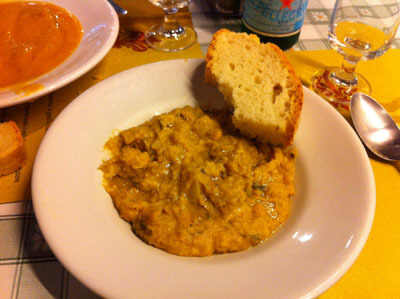 In any case, I’ve never liked tripe, having had it in various forms – soups, stews, poached in milk – but I had every faith in Florenzians to come up with a decent version. Nor was I disappointed. Tripe sandwich is the only acceptable way of eating tripe I’ve come across, and it is generally a pretty tasty eat. This has much to do with the fresh bread roll and delicious tart parsley sauce with grassy shot of olive oil (no matter how many bottles I bring home they never taste the same as in situ…). They’d also done something to the tripe to remove it’s usual blandness and make it taste more like beef. Which is a good sandwich filling. 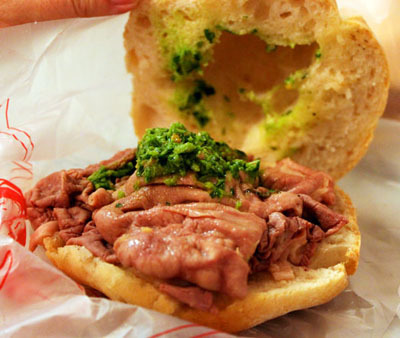 Little vans selling tripe sandwiches are scattered around the city, though the best are found in the Mercato Lorenzo.